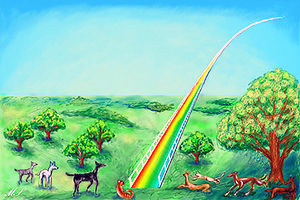 Welcome to Rainbow Bridge. This is the place where owners of Schnauzers and other cherished pets can share their treasured memories of their beloved canine companions who have passed away. Dogs are Man and Woman's Best Friend. They enrich our lives, they make us laugh, they make us cry. They comfort us when we are down, they forgive us when we make mistakes. They are always there for us, our loyal friends. They love us through thick and thin, no matter what. The bond between a dog and his or her owner is so stong and so special. 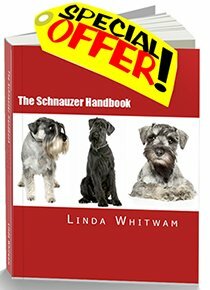 If you have a story of a Schnauzer or other pet who is no longer here, Max, Linda and our readers would love to hear from you. Pet bereavement is so sad, but remembering and sharing the happy times can help us to cope. When an animal dies that has been especially close to someone here, that pet goes to Rainbow Bridge. There are meadows and hills for all of our special friends to run and play together. There is plenty of food, water and sunshine and our friends are warm and comfortable. All the animals who had been ill and old are restored to health and vigor. Those who were hurt or maimed are made whole and strong again, just as we remember them in our dreams of days and times gone by. The animals are happy and content, except for one small thing; they each miss someone very special to them who had to be left behind. Do you have a heartwarming story of a beloved Schnauzer or other pet who is no longer with us? Please share it with us.